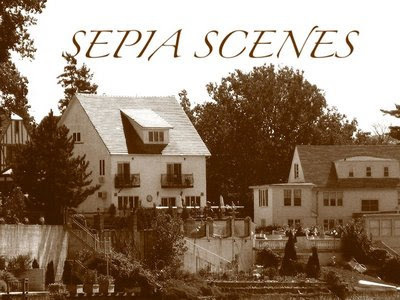 Hi Everyone today is the 4th post of our Sepia Scenes meme! 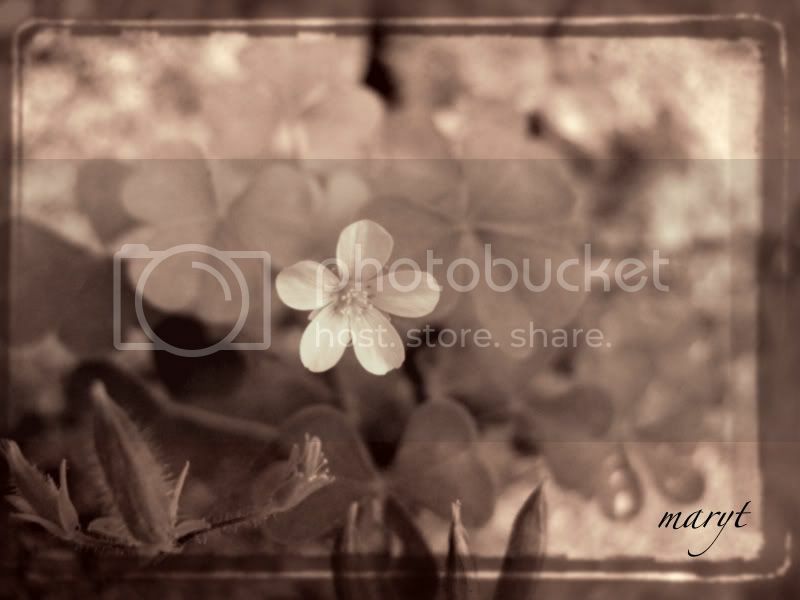 I wanted to render this little yellow flower of the clover family in sepia today. First I chose to get rid of all the color information using Adobe Photo Shop 7. Then in Photobucket online I used the Old Photo filter and then the Bronzing effect. I then used the slider to Fade the effect. Please sign Mr. Linky and leave a comment after you've posted your Sepia Scenes on your blog. Don't forget to visit your fellow participants. I already had a theme for this week, but I decided I could toss in something akin to a portrait along with it. I wouldn't ave thought of applying a sepia effect to a flower but yours looks just great. Amazing what a sepia effect will do! Loverly. The little yellow flower looks very outstanding but retains a lovely background of a similar hue due to the sepia tones; sepia tones help blend the background as one with the focal point. It creates a lovely, restful composition. In my haste I neglected to comment on the fascinating way bronzing this flower made it jump out of the background. It may have done the same in color, depending on how much it contrasted with the leaves, but I'm with Me Ann... this way it's "restful". And even more delicate than it would have been in vivid color. It turned out well Mary! I like that option in Photobucket too! Since I did horse portraits last week as one of my sepia scenes, I have done something different this week. My Sepia Scenes are here and here. I like this very much Mary. I especially like the way the techniques you used made the little flower so significant with all else diminished. I luv this! Great effect! Oh my goodness I wasn't aware that we were following a theme every week. I am so very sorry. I did not do a flower this week. Next week I will try to check in earlier and find out what the theme is. Your flower looks just great. I did a flower last week so I changed this week. I love how yours turned out Mary. And also this week I remembered to leave comments on how I got the photo to the stage I posted with. The flower is lovely, but I'm really impressed with the photo in your banner. Love that effect! I'm a little late getting around, but I made it! The flower looks wonderful in sepia. Great presentation. Nicely done Mary! Since starting this meme with you I'm constantly looking for subjects - it's been a wonderful idea. I'm posting a portrait and something from my Amish Country trip. amazing. I love the sepia scenes meme! I love your sepia effect and how professional you go about it!! I just apply the sepia tones to the original picture...I will play around more next time. I made a portrait of my father this weekend and turned it into sepia. The portrait looked great, but the sepia made it look like he was dead, it was horrible. So I'm doing something completely different this week, I'm sorry! Such a pretty flower in sepia! There is such a soft delicateness to it! Beautiful - you did a great job! I LOVE it! The sepia makes it all so warm and the delicate flower looks so sweet and fragile. I love to be here..
Mary, That flower looks adorable in sepia. That's beautiful sepia Maryt. I like it very much! Hope you don't mind if I play along. Love the photo's I have seen so far. Teach, come and see my baby Pity! Very nice, I love sepia too!